What qualifies to be a US Manufacturer for the purpose of this event? If you currently manufacture finished, shelf ready product in the United States, as qualified Country of Origin US per the FTC guidelines. FTC requirements (Federal Trade Commission) and Customs for US Country of Origin (COO). Am I automatically accepted to attend Open Call if I am a supplier for Walmart, Sam’s Club or Walmart.com? Current suppliers qualify to participate in the Open Call meetings only if the products being presented are qualified as Country of Origin US per the FTC guidelines, AND the item is in a category different from the current business with Walmart, Sam’s Club or Walmart.com FTC requirements (Federal Trade Commission) and Customs for US Country of Origin(COO). How do I log in to review my application? 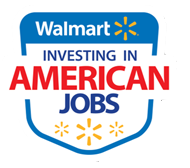 Walmart will schedule all supplier meetings between Buyers and/or State Representatives for the event. . If approved, you will receive a custom agenda via email from walmart@mybusinessmatches.com. You will find out participation of Open Call buyer meetings by June 24, 2015 and State Agency meetings by July 1, 2015. How do I cancel a meeting/participation? If you cannot attend the event, please notify us in advance to make adjustments to Buyer/State Representatives schedules accordingly. To cancel, email walmart@mybusinessmatches.com or call 210-858-7379. When should I book travel? We recommend you to wait on booking travel until you have received confirmation from Walmart. Expect confirmations to be sent via email by June 19, 2015. What is the version recommended to view and/or apply to the 2015 US Manufacturing Summit? To view the website, it works best in the Google Chrome browser. The links in your enrollment email will open in Internet Explorer, however, we recommend you copy the link below, paste it into Google Chrome, and bookmark it for future use. Email confirmations will be sent to applicants within 15 days of applying. Who do I contact if I have a question regarding my application? How do I know who and where I will be meeting for the Open Call Meeting on July 7th? If your application is approved, individual open call meeting schedules will be communicated by June 24th via email. Is it required to attend the Network Reception on July 7th? We encourage all those in attendance of the event to attend the reception if you want to take advantage of making connections with state officials, or other supplier contacts. Applications will be accepted on a first come first serve basis, until the event is full. We recommend applying as soon as possible.